Cafe on London Road. 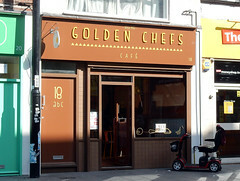 It was previously called Golden Chef's Grill photo, but changed its name to Golden Chefs Cafe when it got a Connected Croydon shopfront refurb in 2015. Accessibility: A small step (kerb-height) to get in, then a shallow ramp. Haven't checked the toilets yet. The tables are not fixed, but are a little heavy to move if you need more room. Child-friendliness: Three highchairs available for children. Last edited 2019-01-03 14:21:35 (version 38; diff). List all versions. Page last edited 2019-01-03 14:21:35 (version 38).